Vincent Carretta. 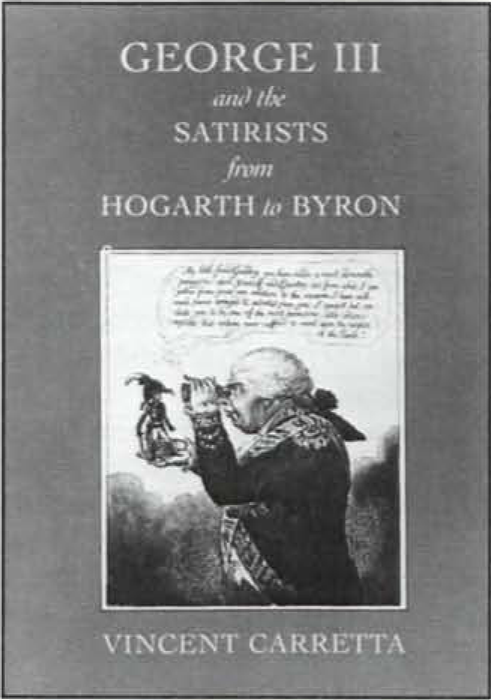 George III and the Satirists from Hogarth to Byron. Athens and London: The University of Georgia Press, 1990. xviii + 389 pp. 161 illus. $40.00. This book addresses a very real need. Recent scholarship has increasingly revealed how fully attuned Blake was to all aspects of the culture of his times. An active radical in the tumultuous social, political, and intellectual milieu of Europe’s largest city, Blake could scarcely have escaped the influence of the satiric tradition that found graphic expression in the flood of political caricatures that swelled as the eighteenth century progressed. Particularly during the reign of George III, this rich tradition of vigorous political and cultural commentary subjected both to investigation and to ridicule not only the royal and governmental institutions whose locus was the king but also the person of the king himself. Partly because study of this vast storehouse of visual imagery was for a long time limited by physical access to repositories like the British Museum, and partly because that study was often the province of rather narrowly-defined specialists, and partly too because literary criticism has historically been slow to appreciate that literary artists lived in a world rich in non-verbal art and other public phenomena, Blake’s relation to this vein of popular art has remained only minimally explored. David Erdman and others have pointed out some of Blake’s debts to leading graphic artists like Gillray, but no one has to date undertaken the sort of definitive survey the subject requires. As the visual riches of the begin page 83 | ↑ back to top British Museum Print Room become more and more accessible in this age of technology (the entire collection of the British Museum’s caricature prints, keyed to their catalogue numbers, can now be had on microfilm from the BM, for instance), it is inevitable that someone will take up the challenge and begin systematically to survey Blake’s relations specifically to that visual tradition. Even where relations can only be surmised, rather than definitively documented, the value of such a study—and of the visual archive it must necessarily constitute—for the further investigation of Blake’s encyclopedia art goes without saying. Vincent Carretta takes us a step in the right direction in George III and the Satirists from Hogarth to Byron, the first serious, extensive examination of the subject in over a century; Thomas Wright’s Caricature History of the Georges goes all the way back to 1868 and is comparatively unsophisticated both in its methodology and its conclusions. More recent studies like M. Dororthy George’s Hogarth to Cruikshank: Social Change in Graphic Satire (1967) or Herbert Atherton’s Political Prints in the Age of Hogarth (1974) survey the broad visual landscape, but without the sort of tight thematic focus we find in Carretta’s carefully limited study. Despite the author’s decision to keep his focus relatively narrow in a heroic effort to keep his material relatively manageable, the book still runs nearly 400 pages. While he is not writing strictly about Blake, Carretta nevertheless devotes a chapter of nearly 100 pages largely to Blake’s place in the tradition of caricature and visual satire that centered on George III from his accession to the throne in 1760 until after his death—blind, mad, and curiously popular—in 1820. What Carretta has to say about Blake will of course be of particular interest to readers of Blake, and I will discuss that in detail shortly. rests upon two typically complementary views of the king: as monarch and as man. The king’s is both a regal body and a mortal, physical one. Under the Hanoverian scheme of things legal and monarchical, as it is delineated for us particularly by Blackstone in his Commentaries, the king as monarch is by definition “perfect” and “immortal.” He reigns and rules in a secular context, but his role as king resembles that of the pope, who is regarded as infallible when he speaks ex cathedra, that is, from the seat of the Church and as its divinely appointed spokesman. The inherent patriarchalism of this arrangement (and the resistence to opposition, however mild, that goes with it) thus symbolically affiliates the two father-figures, England’s vigorous anti-Catholicism notwithstanding. As man, however—as mortal, fallible, gullible human being—the king is as vulnerable as any of us: he sits on his throne with a posterior quite as mundanely mortal as ours. The monarch’s mortality is in fact the ostensible chink in his armor that admits alike the lance of lampoon and the arrow of discerning intellect. Indeed, the trigger mechanism in much of traditional satire, as Fielding pointed out in Joseph Andrews, is the ridiculous—in particular the pretentiousness of the mortal who would be perfect and immortal. The plain humanness of George III figured increasingly in the history of his treatment by the satirists; so much so, in fact, that this seeming liability was gradually transformed by the age of Napoleon into both an asset and a strategy. In the early years of the Hanoverian ascendency satirists trod carefully. Civil war was still a troublingly recent chapter of English history and culture, so that even early satires on the first two Georges were comparatively mild, owing in part to the residual English conviction of both the inevitability and the naturalness of the monarchy and both its figureheads and its attendant figures. The remarkable growth of English self-assurance in the increasingly nationalistic eighteenth century—indeed the growth of a collective cultural swagger that permeated the culture generally and rendered it smugly self-satisfied—gave rise to greater public audacity on the part of visual satirists, many of whom were able in any event to hide behind the often transparent but nevertheless legally sufficient anonymity they could assume simply by not signing their prints. For his part, George III gave no little assistance to the satirists’ cause by his inexperience and naiveté, as for instance in allowing the perception to persist that he was a mere puppet of the much-despised John Stuart, third Earl of Bute (the Scot pronunciation of whose name led naturally to the iconographic trope of the boot, variously accompanied by tartan or kilt, visible in countless prints). Furthermore, the performance of the king and his various ministries during the wars with France and then the American colonies, and then with revolutionary France, together with the king’s personal habits (frugality, for instance), interests (agriculture), and characteristics (his explosive, idiosyncratic speech), furnished a seemingly inexhaustible supply of ammunition for the satirists, be they Whig or Tory. During the French Revolutionary period George’s stock rose, however, at begin page 84 | ↑ back to top the same time that his image was gradually being melded by the caricaturists with that of John Bull, so that by the first decade of the new century even the idiosyncratic Farmer George came off visually superior to the caricatured[e] generic Frenchman and, subsequently, the caricatured Napoleon. George’s increasingly popular image (whether or not it corresponded to reality) as conservative traditionalist father, as frugal and long-suffering parent, was helped along of course by the increasingly scandalous behavior of his sons, and particularly the dissolute Prince of Wales who would become Prince Regent during his father’s final decade and then King George IV upon his death. So complete was the turnaround in George III’s reputation that even Byron found himself treating him more with relatively good-humored humanity than with withering satire in his remarkable send-up of Tory apologist pretension in The Vision of Judgment. As Carretta properly reminds us, George’s increasing popularity after the execution of Louis XVI in 1793 forced English radicals generally to accommodate their own agenda to loyalist defenses of monarchy and its figureheads. This meant, for instance, that the sort of attacks on the king’s indecisiveness, naiveté, or compliance with (perceived) manipulation that characterized the first three decades of his reign had to be tempered so as not to generate among the reading and viewing public sympathy for the figure they aimed to undermine and ridicule. Backfires were increasingly likely, and the radical opposition had to tread carefully. Even the best-known caricaturists—like Gillray—revealed in their work an essentially conservative agenda that questioned not so much the embedded institution of monarchy as its surface trappings, procedures, and affectations. Increasingly, the combined figure of George III/John Bull was portrayed less as the perpetrator of offensive acts than as their victim. This phenomenon itself marks an interesting turnabout, for in the early years of George III’s reign (and particularly in the period just before and during the American conflict) one of the most common visual tropes of the Tory caricaturists was the tormenting of the emblematic Britannia by recognizable foreign types (including, after 1770 especially, the emblematic American Indian) or by equally recognizable members of English cabinets and political circles. Perhaps the most profound contribution that George III and the Satirists makes to the field lies in its nature as a storehouse of visual materials. While Carretta quotes freely from a broad range of eighteenth-century poets (among whom Charles Churchill is particularly visible) in demonstrating the relation of the satirical print tradition to that of verbal satire, it is the selection of 161 illustrations that draws the reader deeper and deeper into the book, and into its immensely rich subject matter. Carretta traces the evolution of visual treatments of George III by first surveying the tradition of royal satire as it had developed throughout the century, so that we see more clearly how satirical treatments of George III developed logically from both a visual-arts tradition and a changing cultural-political environment that encouraged their proliferation. As usual with a book of this sort, there is some risk that the visual text will overshadow the verbal text, a phenomenon familiar enough to students of Blake’s illuminated art. It does not happen here, but not surprisingly the alliance between the two components of the discussion is occasionally an uneasy one, in part because verbal and visual satire, for all their common themes and devices, nevertheless are executed in artistic media that are fundamentally different both in how they operate and in how we perceive and respond to their products. Partly because there is so much to account for in each print, and partly because for every print included in the volume the author refers to two or three others (appropriately documented with British Museum Print Catalogue numbers, happily), much of the discussion is heavily descriptive. Nevertheless, in opening up for the literary scholar this trove of visual material, extensive descriptions of the nature and function both of iconography in particular and visual structures and strategies in general are probably inevitable. Better to err in that direction. In any event, even when rehearsing the seemingly obvious, Carretta’s comments are seldom without useful and instructive insights. Among the earlier prints discussed, some that should prove especially interesting to Blake scholars are efforts like “A Political Medley” (1740; fig. 2; BMC 2453) and “Bob’s the Whole” (1740; fig. 11; BMC 2464). These elaborate prints contain verbal texts that employ the device of the rebus, substituting visual images for cognate words or syllables. The relationship to Blake’s interlinear illuminations is striking, and perhaps the examples Carretta supplies here will encourage others to explore this phenomenon in greater detail, for it suggests another, more contemporary alternative to the medieval illuminated page as a possible visual source for some of the interlinear devices in Blake’s illuminated poems. It is probably unnecessary to remark on the strongly literary nature of English political caricature generally in the eighteenth and early nineteenth centuries, a point that emerges clearly from Carretta’s discussion. The literary allusions employed by the caricaturists are extraordinarily wide-ranging, which suggests the extent to which the sort of multi-level allusiveness[e] we associate with the “high art” genre of history painting was in fact also a standard feature of the “lower” art of the satirical caricature print, as it was too of other vehicles of popular art. Again, the relevance of this observation for our increasing appreciation of Blake’s art—taken within the cultural context of its time—likely goes without saying. Europe (the latter of which he calls “Blake’s revision of Pope’s Dunciad 4” ). Carretta locates Blake in the radical opposition camp along with partisans like Paine, who regarded all kings as usurpers by birth and by inheritance. These radicals, whether they worked in verbal or visual media, sought to subvert the social, political, and religious establishment by turning its own words and images against it, appropriating royalist iconography, for instance, in an effort to alter the body politic. As an example, Carretta singles out for extended discussion plate 11 of Europe (the “Pope George” icon), relating Blake’s visual procedure in this and related plates to the evolving delineation of the king’s figure elsewhere in the graphic arts. 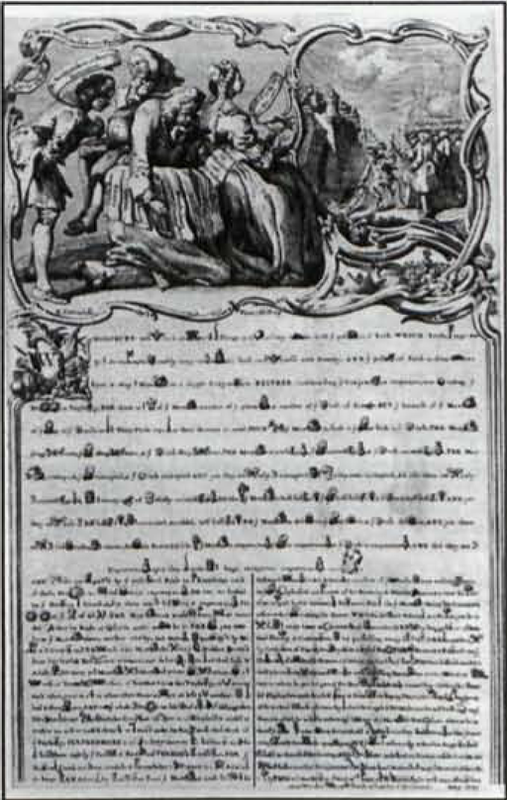 In visually conflating George, the pope, and Satan, the author suggests, Blake identifies the King not as the figure of (perhaps grudging) affection who was emerging in the English consciousness, but rather as the epitome of Dulness placed in that most pernicious of positions: as dictator over a self-deluded and self-enslaved populace. Carretta seems at times to be pushing too hard on claims about visual influences on Blake’s illuminations, as he does for instance in his discussion of Blake’s use of images of thistle and rose (200-19). The thistle, emblemmatic of Scotland, provided a bit of visual shorthand by means of which verbal and visual caricaturists could allude to what Charles Churchill and others called “Scotch politics”—alleged abuses of royal power and prerogative, particularly as influenced by the ubiquitous Bute. Certainly Blake’s images must be seen within the context of a familiar and politically charged visual language, but tying each image, in all its occurrences, to minutely particularized signification (and therefore at times to too narrowly exclusive referentiality) may in fact serve more to limit and bind Blake’s richly intertextual allusions than to liberate them. Nor will all of Carretta’s claims and categories about matters both general and particular necessarily set well with all students of Blake’s work. For example, he locates the poems of the 1790s—the early Lambeth prophecies in particular—specifically within the satirical tradition. Even granting that the three poems to which Carretta devotes the most attention (America, Europe, and Visions of the Daughters of Albion) all possess strong links to the traditions of intellectual, political, and religious satire, their affinities extend significantly and meaningfully to other genres and traditions as well. To be sure, Carretta points out that Blake’s sources “are in the satiric and nonsatiric words and pictures, albeit transformed and transcended, of his radical predecessors on both sides of the Atlantic as well as in those of his radical contemporaries” (158). But in pressing these works into the parameters defined by the title of his book, Carretta inevitably strips them of some of their richness even as he strives to attribute that richness to them. It is a difficult tightrope, and only one of many faced by those who would write on Blake and artistic tradition. Much of what we say about Blake’s use of sources, both visual and verbal, has necessarily to be tentative, based as it frequently is on circumstantial evidence of various sorts. The danger lies in implying (or asserting) that the convergence of various bits of evidence, often linked chain-fashion by rhetorical device rather than by incontrovertible (or at least reliable) physical evidence, constitutes proof positive. In his discussion of America, for instance, Carretta outlines a reasonable, plausible reading of the interrelation of Albion’s Angel and Orc within a framework of family conflict, basing his reading on his claim that “Blake chose to organize America by wit—an emphasis on the essential similarity between two apparently dissimilar objects” (174). But setting up the work in terms of this dualism, which turns out to be only an apparent dualism, leads the author to regard the figure on the final plate of that poem as Urizen, despite that figure’s feminized features, its un-Urizen-like blue hair (in copies A, K and R), and its brownish (copy K) or gray-green garb (copy M). Granted, in his minute assessment of this image in The Illuminated Blake David Erdman itemizes both masculine and feminine attributes. Nevertheless, this figure would seem to be, if anything, not Urizen/Albion’s Angel/George but rather Britannia, the suffering female emblem of the English nation whose own history in eighteenth-century caricature prints is long and varied. 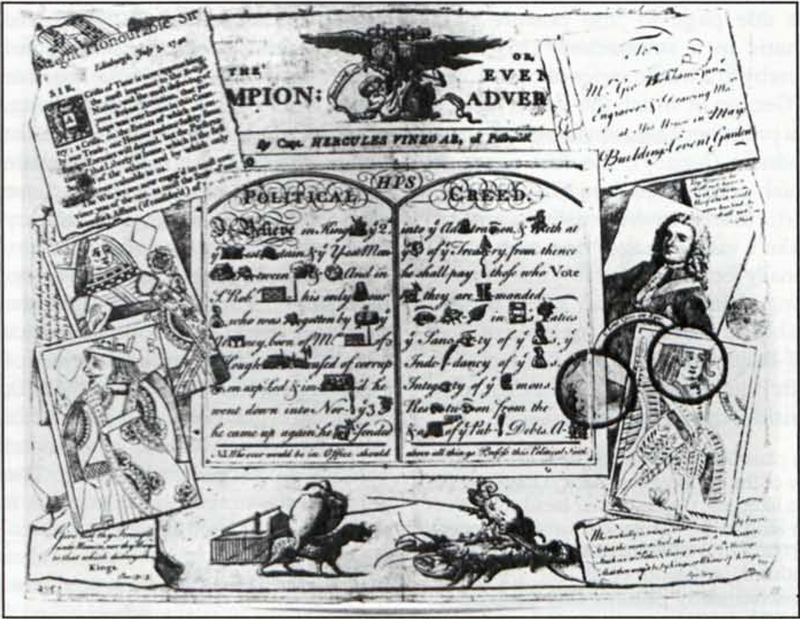 Similar grasping at definitive signification occurs in claims that the predatory eagle at the top of America 13 is “another dehumanized version of George III in his ‘Dragon form’” (187), or that “the grave door on plate 12 of America takes the form of a bound volume on a bookshelf” (197). The suggestions are reasonable enough; it is the sense of definitiveness and exclusivity inherent in the rhetoric that makes one uneasy. There is always some danger in Blake scholarship of working so hard to discover what particular visual or verbal images might be, could be, or might possibly be likened to or derived from, that one may depreciate or even overlook entirely what they in fact are, really and actually. One gets a sense of such a tendency at times in the discussion of Blake’s illuminated works and, less pronouncedly, in that about the separate satiric prints of others. Two final points need making. First, some purists may find that the extent of the author’s acknowledgments of the body of existing criticism does not always match the extent of his appropriations from that body; a single “See x,” for instance, will sometimes be the only attribution in a discussion that draws freely for several pages on that original scholarship. This is in some respects, however, a stylistic and procedural choice, since the text makes clear that the author wishes to keep secondary citations out of the main text as much as possible rather than mixing them in with the abundant citations in that main text of primary authors and graphic works. Second, although it is wonderful to have over 160 illustrations, the images make one wish—as usual with illustrated books—that they could be more finely reproduced, especially since we are dealing with illustrations that reduce the images significantly from their original proportions. The illustrations are interspersed with the verbal text, so that we are spared both the glossy pages and the flipping back and forth that attends the usual procedure of subjoining a plates section. But the images are neither so sharp nor so clear on the printed page as one would like. Again, though, Carretta’s thoughtful[e] decision to include complete British Museum catalogue citations for the illustrations and for the prints that are not included will make it much easier for other scholars to follow up on images and prints that particularly interest them. And certainly the University of Georgia Press is to be complimented for its obvious effort to do justice to the material by including so many reproductions, a decision that may have left budget managers wringing their hands but which has to leave readers clapping theirs. There is no question that George III and the Satirists adds importantly to our appreciation of Blake’s art, even when its contributions are indirect rather than direct. This is an important source-book, as well as a graphic reminder of how much fertile ground remains yet to be cultivated in laboring the Minute Particulars of Blake’s visual art. Studying the prints collected here, and musing on their relation to Blake’s visual and verbal art, should remind us once again how much a man of his real, temporal, urban, and very public world Blake actually[e] was. The more one sees of such material, the more one can recognize that for all his fierce independence of mind and vision Blake was far less the detached, idiosyncratic eccentric he used carelessly to be accounted. If it does nothing else, Carretta’s book renders an important service by reminding us to look again—and again.